If you want to know how to make tabletops out of bottle caps, you'll need a few simple materials and a whole lot of patience. Like other DIY furniture projects, such as building bookcases or coffee tables, making tabletops out of bottle caps can take a lot of time but the result is totally worth it. The look is fun and casual and works well in relaxed areas such as games rooms, dens, bachelor pads, and cottages. Bottle cap tabletops are fairly easy to make - despite the time it takes to collect and place the caps - and they don't take anything away from the form or function of the table. Just remember to use a table that you won't mind damaging as once the caps are attached as they cannot be removed without causing harm to the table surface. The first step is obviously to collect bottle caps. Try to keep them all close in size and material. 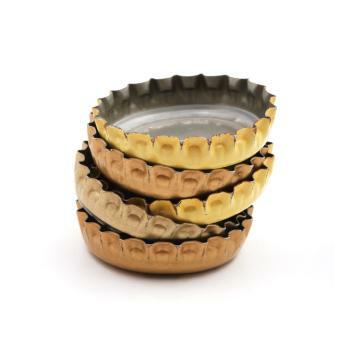 For instance, don't mix metal beer caps with plastic soda caps. The result will be uneven and it won't look uniform. The number of caps you'll need will vary depending on the size of the table. It's fairly safe to say that the number will be in the hundreds, and possibly over a thousand for a larger table. Ask friends, family, and co-workers to donate to the cause. Set up a container at your desk and/or in your home where people can toss them. Once you've collected enough caps, create a pattern by laying out the caps on the table. Use different colored caps to create different designs. You can use a particular brand of cap to outline the table, or if you have an appropriate combination of colors, you may want to create a picture. Geometric designs can look especially attractive. Gluing the caps to the table is the easiest way to attach them, but be aware that the glue can dry out over time and it may require occasional maintenance. Leave the finished design on the table and prepare to glue the caps. Use a hot glue gun and make sure you have enough glue sticks to finish the entire table before starting. Start in a corner and slowly work your way out. Lift the caps (one at a time) and place a dab of hot glue in its place. Press the cap down firmly and hold it in place for about 5 to 10 seconds. Continue this process until all of the caps are attached to the table. When you're placing them on the table make sure that the caps touch, leaving no visible table space between them. Hot glue dries very quickly but it's best to leave it for several hours before placing anything on the table. To help keep them in place and create a more finished look, have a piece of glass cut to fit the table and place it on top of the caps. By using plaster and mortar you can treat the caps like tiles and create a more solid tabletop. Fill bottle caps with plaster and let them dry a few days to create bottle cap "tiles". Once they're ready, roughen the table surface with sandpaper and spread a layer of mortar on top. Let the whole thing dry according to the package directions (usually overnight). Once it's dry, spread a layer of mortar/grout over the top of all the caps and into the spaces between them. Make sure you're using grout that does not contain sand. The kind with sand will scratch the caps. Wipe off the tiles with a damp cloth immediately after (don't give it a chance to dry). Once they're clean leave the table to dry for a few days. Once again, for a finished look you can add a piece of custom-fit glass on top. This will create a smooth top, but it isn't necessary to hold the caps in place. If you've used mortar, those caps won't be going anywhere. Knowing how to make tabletops out of bottle caps will allow you to take on a simple DIY furniture project that will create a great conversation piece in your home. It's easy, fun, and won't break the bank.